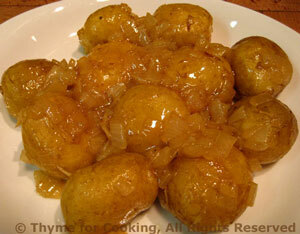 Braised New Potatoes with Bay and Onion, Thyme for Cooking gourmet potatoes. Cooked with onion and bay, and finished with a savory glaze, these make a perfect side dish for spring. Heat oil in medium nonstick skillet over medium heat. Add oil, onion and sauté until onion is tender, about 5 minutes. Leave potatoes whole (should be golf ball size or smaller) If using larger potatoes, cut into quarters. Add bay leaf, potatoes, stock and vinegar. Cover and simmer until potatoes are just tender, about 20 minutes. Uncover and continue to cook, stirring occasionally until stock has reduced to a thick, syrupy glaze, about 10 minutes.